This is a fantastic guest post by author Aaron Ritchey! Take it away Aaron! For a long time, every novel I wrote became a dumping ground for cool ideas, and where did I stick these gems of self-indulgence? In the middle. I’d stuff books full of cool little things that didn’t support the story arc or the character arcs. Ah, those heady days of failure and despair. I miss them, writing books no one could read. Well, I had two hearty friends who would weather through all that cool nothing, but only two. Story, by Robert McKee, changed my writing life. I left the world of seat-of-your-pants writing to become a wanna-be plotter. I still write seat-of-your-pants, but I start out with a map of my story, and I just adore the three-act structure. I’m big, huge, climactic sort of guy. I like the eye-bleeding, soul-crushing, world-destroying climax and the three-act story structure gives you at least three climaxes—end of Act I, end of Act II, end of Act III. Queue explosions. With the three-act structure, there is no real middle because you are always building toward the next climax. And if you are really good, you slam in a reversal right there in the middle that changes everything! I did that in my debut novel, The Never Prayer, by a big reveal. In the middle, I revealed who the villain of the book really was. And once the reader hits that part, the whole book changes. Let’s take another example from probably the tightest story I know, Jane Austen’s Pride and Prejudice. And you thought with all my talk of world-destroying climaxes, I would do something with more bazookas, but really, Pride and Prejudice has a ton of conflict and climaxes without a single gun (or zombie). Not sure if Jane Austen followed the hallowed three-act structure, but look what she does in the middle of the book. Elizabeth Bennett refuses to marry Mr. Darcy, which is like taking a winning lottery ticket and ripping it into pieces. It’s a game changer and it changes everything we think we know about Mr. Darcy. It’s a reversal and a reveal. Mr. Darcy was in love with Elizabeth Bennett the whole time! Shocking. Like with any good reversal/reveal, things can never be the same, and I love the tension that follows when Elizabeth runs into Mr. Darcy at Pemberley. And before we know it, we are heading toward the end of Act II where Elizabeth’s hopes of ever being with Mr. Darcy are dashed by her stupid little sister Lydia. Like I said before, if you get your story down into three acts, there is no middle because each act will have its own structure of inciting incident, growing conflict, and climax. And it’s funny but generally the story is going to want a reversal/reveal in the middle of Act II. Stories, I believe, grow organically and the ideas will come through following the process. It’s cool, strange a little, but stories want that kind of structure, and the more skilled you are, the more you can really slam something in the middle that is completely unexpected. So in thinking of your work-in-progress, what secret can you keep hidden until the middle that will change everything? What obstacle can you throw at your hero that will lead to the dark moment in the book? What character can suddenly turn rogue and villainous? That Mr. Wickham, what an a-hole. Above all, trust the story. It will give you what you need. And keep a notebook for all your cool ideas because if you write long enough, you can incorporate them in a little at a time. You wouldn’t want to dump all of your cool into one story! Aaron Ritchey Bio: YA Paranormal author Aaron Michael Ritchey has penned a dozen manuscripts in his 20 years as a writer. When he isn’t slapping around his muse, Aaron cycles to look fabulous, works in medical technologies, and keeps his family in silks and furs. 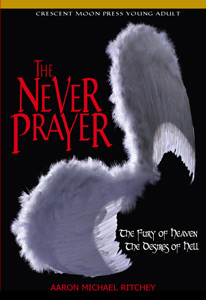 His first novel, The Never Prayer, dropped March of 2012 from Crescent Moon Press. Boy, did I need this post today! Excellent reminder of how the three act structure works! Thanks Lindsey! Like I said, I love the three-act structure, though at times I don’t follow it as closely as I probably should. It’s good to aim, though, for the three climaxes. I want a book with all that cool stuff, and a story. Cookie?